Latinos are no longer waiting for corporate media conglomerates to wake up and smell the coffee. With the tools at our disposal we are taking matters into our own hands and creating our own opportunities. Filmmaker Fanny Veliz did precisely this and raised funds to shoot her first feature film. Now that the film is completed she has created yet another opportunity for you to get involved with your local communities to create positive change. Please read the following press release and contact Ms. Veliz with any questions. Filmmaker Fanny Véliz wants to bring the Hollywood machine to her. Los Angeles, CA – January 7th, 2013 – Writer/Director and actress Fanny Véliz raised production funds to shoot her first feature film, Homebound last year, through the increasingly popular internet crowd funding method. Now that the film is complete she is turning to the community once again with a unique concept. “Use my film to raise funds for your organizations, it’s a win-win situation.” Says Véliz. 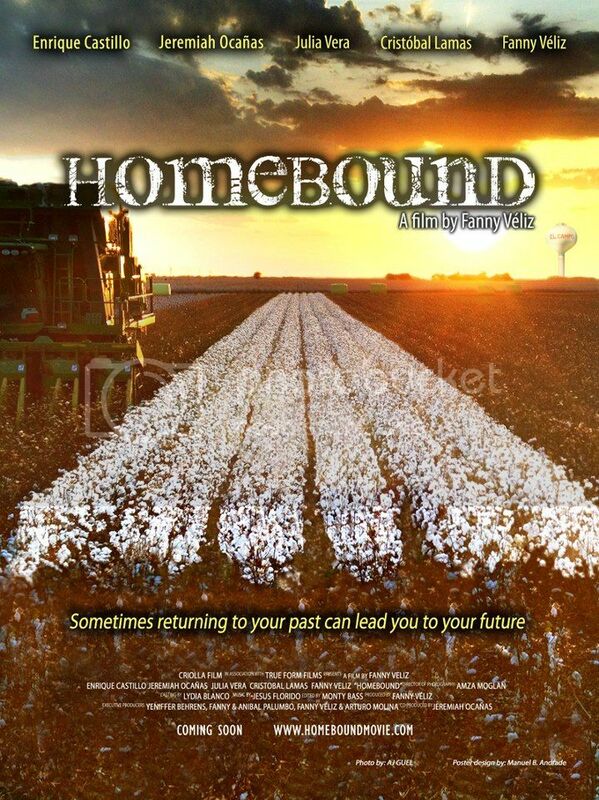 The goal is to show to Hollywood that there’s a hungry audience out there ready for a film like HOMEBOUND. It is about empowering the community to empower filmmakers to tell the Latino stories Hollywood chooses to neglect. “I’m committed to helping transform the image of Latinos in the media by telling stories that aren’t usually told,” says Veliz. “We are all used to seeing stories of immigration, gangs, and other stereotypes, this film shows another side of the American Latino. Homebound is an American story, a human story told with an American Latino cast.” Homebound tells the story of Richard Lynn, a successful young Latino business professional who returns to his small hometown in Texas to help his dying father. His father insists he take over the family business, a bar. Secretly, the young man wants to burn down the bar because he blames it for the death of his own mother and the illness of his father. In the process he rediscovers his childhood’s small town and falls truly in love for the first time. The film features a cast of seasoned actors which includes Enrique Castillo, whose work in such films as El Norte, Mi Familia and the cult classic Blood In Blood Out have made him a fan favorite among Latino audiences and his role in Showtime’s Weeds has made him a hit among mainstream audiences. Texan born Julia Vera, who has built a career as a character actress in film and television for over twenty years is not only an actress in Homebound, she is also invested in the film as an associate producer. Richard Lynn is played by a dynamic young actor, Jeremiah Ocañas, who not only plays the lead, he is also a native El Campo, Texas, where the film was shot. El Campo served not only as the prime location, but its citizens helped facilitate permits, meals, lodging, a source of talent pool for minor roles and the extras, and even a helicopter needed for the shoot. Fanny Véliz, in addition to her producing, writing, and directing duties also plays the female lead in the film. Community is at the centerpiece of this undertaking. It takes a community, and Véliz is hoping to once again enlist community and embrace the film through the “Community Screenings” concept, and help them raise awareness of the film. The production company is currently looking for organizations, companies or individuals nationwide that would like to host a “Community Screening” of the film. They would need to commit to create a screening, which would raise money for their own Non-Profit organization or other Non-Profits they wish to benefit. Each host will receive a Homebound Party Pack that will take them step by step on how to tailor the event to the Homebound theme. Why is it important to support this film? The success of this film opens doors for new voices creating more opportunities. Let’s support each other and grow. Latinas and Cancer: “I do not feel any less of a woman,” said Angelina Jolie of her double mastectomy. Have you watched the documentary movie Lemon yet? Latinas and Cancer: “I do not feel any less of a woman,” said Angelina Jolie of her double mastectomy. American Latina Firsts in US Government I’m Giving Away FREE Miami Movie Tickets Have you watched the documentary movie Lemon yet?